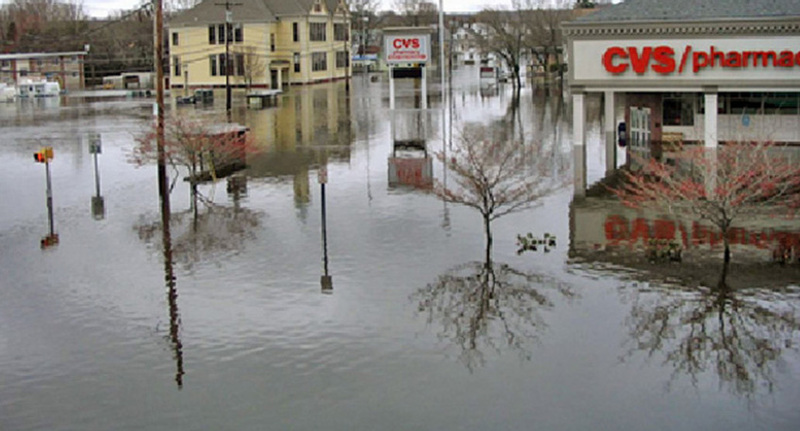 The Federal Emergency Management Agency (FEMA) flood maps are often criticized and called confusing, and they’re also way wrong, according to one of Rhode Island’s foremost climate-change experts. Grover Fugate, executive director of Rhode Island’s Coastal Resources Management Council (CRMC), called the maps “insanity” during a recent interview with ecoRI News. FEMA’s maps represent the federal government’s best estimates of floodplains, and they hold much power. They are the standard in determining building codes and setting insurance coverage. When property isn’t included on these maps, owners aren’t required to buy flood insurance — often creating a false sense of security. These maps, however, are typically out of date and based on historical flooding and past development. They don’t anticipate climate-change trends, they often ignore rising sea levels, and they don’t account for rapidly expanding development in flood-prone suburban regions, according to critics. “Texas developers in Galveston are ignoring FEMA flood maps and building more resilient structures,” Fugate said. “FEMA maps in some incidences are 10 feet off. A three-foot wave can take a building out. These maps don’t account for offshore wave activity." By the end of this century, Rhode Island, like much of the East Coast, will be particularly susceptible to the impacts of climate change and sea-level rise, and one of the sectors to feel those impacts acutely will be the real-estate industry. To counter FEMA’s unreliable data, the Coastal Environmental Risk Index (CERI), which expands on what the computer mapping program STORMTOOLS already built, was created to provide the Ocean State with more detailed and accurate flood mapping. The project was led by Fugate and Malcolm Spaulding, professor emeritus of ocean engineering at the University of Rhode Island. Fugate noted that FEMA maps are fundamentally inaccurate because the geographic points they rely on, called transects, are too widely spaced. The CERI maps, he said, are based on many more transects and data points. He also noted that federal flood maps underestimate how more frequent and intense storms will impact the state’s coastal dunes, most notably in southern Rhode Island. Dunes don’t offer as much protection as FEMA would lead one to believe, Fugate said. The Ocean State’s erosion rate is projected to double by 2065, and increase by two-and-a-half by 2100, according to CRMC. The Matunuck area of South Kingstown, for instance, currently averages about 4 feet of erosion annually. Fugate noted that Rhode Island hasn’t experienced a major hurricane since 1954 and that the most recent maps developed by FEMA underestimate the present risk to coastal properties from storm surge, erosion, and flooding, by reducing flood elevations and not recognizing the impacts of sea-level rise during the lifetime of structures. He said STORMTOOLS and CERI were created so Rhode Island no longer had to wait until a storm hit to see what the damage would be. These geographic information system-based mapping tools provide coastal flooding, sea-level rise, and storm-event scenarios, and project storm surge and wave action. If a structure is in a high-risk flood zone, a buyer must get flood insurance in order to get a mortgage. For owners of existing structures within flood zones, taking out a line of credit, obtaining a reverse mortgage, or acquiring any federally attached loan requires the borrower to buy flood insurance. For property owners looking to build any structure within the special flood hazard area requires flood insurance if a mortgage is needed, and new construction has to meet the most recent building codes, according to the Rhode Island Shoreline Change Special Area Management Plan (Beach SAMP). A 2017 assessment from the National Oceanic and Atmospheric Administration projects 9.6 feet of sea-level rise in Rhode Island by 2100. The Ocean State has about 420 miles of coastline, and nearly $4.5 billion worth of property lies on land less than 5 feet above the high-tide line.